The Raiders running back is setting up Skittles vending machines in his favorite spots around his hometown on Sunday. Let it never be said that Marshawn Lynch doesn’t love Skittles: The once-retired Seattle Seahawks running back, who came returned this season to play for the Oakland Raiders, his hometown team, has a well-documented affinity for the rainbow candies and is on a quest to spread the gospel of his favorite sweets. This Sunday, ahead of the Oakland Raiders game against the Jets, on the Bay Area team's home turf no less, Lynch, along with Skittles, will be distributing vending machines containing free candy to some of the player's favorite locations in the city. “He chose a few of his favorite spots around the city so he can share Skittles with Oakland residents on game day, including his own Beast Mode Apparel store; his favorite bike shop, Hank & Frank; The Raider Image, a popular spot for Raiders fans to go before the game; Shoe Palace, his favorite shoe store in the city; and the MLK Student Union at UC Berkeley, which is Marshawn’s alma mater,” a Skittles spokesperson explained. Lynch, by the way, has a well-known bicycling hobby. He once took his bike on a tour of Houston, Scotland, distributing Skittles to the local townspeople in anticipation of the 2017 Super Bowl. 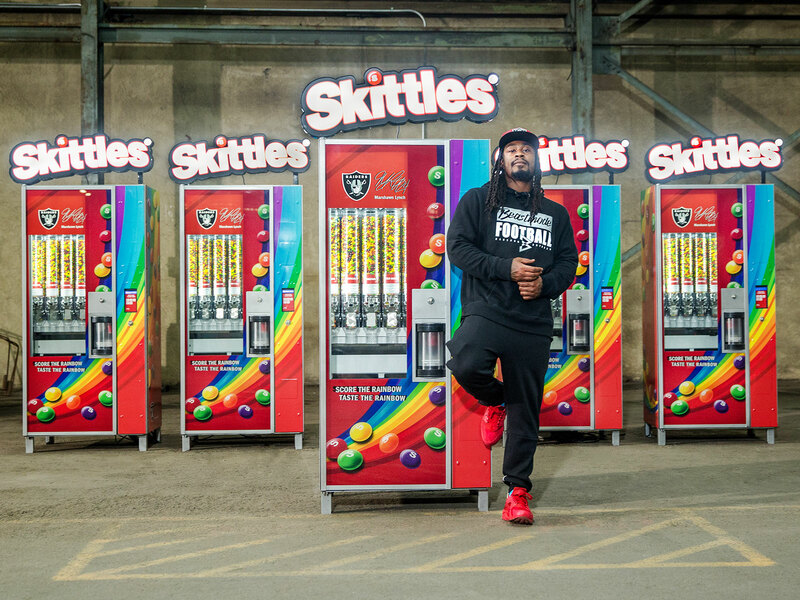 Lynch has been made Skittles his snack of choice since he was a teenager and he hopes that Oakland residents will be “game ready” with the five vending machines—which have been customized with Oakland Raiders’ logo and Marshawn’s signature. Each one will distribute original, Tropical and Wild Berry Skittles for free from 9 a.m. to 1 p.m., for one day only, September 17, the day of the game. Then the vending machines filled with free candy will disappear from Oakland, although Lynch’s presence—like a benevolent, Skittles-loving spirit—will remain behind, to watch over the city. Okay, maybe that’s just speculation, but given Lynch’s love for his hometown, it might just be true. If you’re an Oakland resident, or just in town for the game, keep an eye out for the Skittles vending machines. Who knows, if you’re lucky, you might just catch a glimpse of Lynch, too. Here is a full list of addresses where you can find free Skittles around Oakland today.